On August 14, 2011 the Winnipeg Stadium, (now Canad-Inns Stadium), turned 58. Barring a major construction setback, this will be the final season for the building. In this series I look back at the history of the Stadium and some of the great moments, football and non-football related, over the decades ! Over the decades Winnipeg Stadium has played host to many icons of the entertainment world, sports heroes and even royalty. On June 27, 1982, though, it was filled to capacity for a saint (or soon be saint). 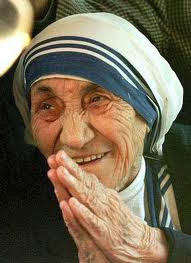 Mother Teresa, Nobel Peace Prize Laureate. She was born Gonhxa Agnes Bojaxhiu in 1910 of Albanian parents in a village in Macedonia. At 18 she followed her calling to serve God and moved to Ireland to join a convent and was named Sister Mary Teresa. The following year, 1929, Mary Teresa arrived in Calcutta and began a career as a teacher, then principal, of a girls school. In 1946 she received another calling to give up her life in education to instead serve the poorest of the poor in her adopted city. After a stint with a medical order, she moved to the slums of Calcutta and spent the rest of her life providing food and medical care to the residents, gaining the nickname "Saint of the Gutters." In the 1960s her mission began to spread throughout the world. By the time of her death in September 1997 there were over 4,000 Sisters in 610 missions, including one established in 1984 on Aikins Street here in Winnipeg. In 1982 she was awarded the St. Boniface Hospital Research Foundation's International Award and agreed to come to Winnipeg to accept the award during a North American trip that summer. Instead of the usual black-tie fund raising dinner, it was agreed that the event would be held at the Winnipeg Stadium with a more modest admittance fee of $10 for adults, $5 for children and seniors. Between 15,000 and 20,000 people filled Winnipeg Stadium for the inter-faith service that included a 300 child choir, the Contemporary Dancers and Knights of Columbus Pipe and Drums Band. "... I accept it for the glory and honor of God and in the name and joy of poor people throughout the world, including the poor people of Canada." "Manitoba's gift is a small expression of our great admiration and unlimited good wishes for the future success of her work among the world's poorest of the poor"